The Beat Bike Toba Crossbar is based around Kalkhoff’s Impulse motor system – perhaps not as well-known as the likes of Bosch and Shimano but actually a company that has experience in the e-bike market pre-dating both those companies. After taking on the Daum mid-motor drive in 2009, Kalkhoff (themselves part of the much larger Derby Cycles group, one of the three largest cycle manufacturers in Europe, who also own the likes of Raleigh) branded the high quality Impulse mid-drive motor as their own. The Impulse motor system used by the Beat Bike has increased power compared to the first version and adds functionality such as back-pedal braking (though not on this particular model), gear-shift sensoring (to ease the motor strain on gears whilst changing gear) plus it gives the option of a 45kmh speed pedelec (the Beat Bike Toba Crossbar tested here is a regular 25kmh / 15.5 mph pedelec and has powerful hydraulic rim brakes as opposed to a rear back pedal brake). It’s worth noting that the Impulse system was superseded in 2015 by Kalkhoff’s EVO system, again to provide more power, GPS functionality and a greater degree of visual integration with the appearance of the e-bike. 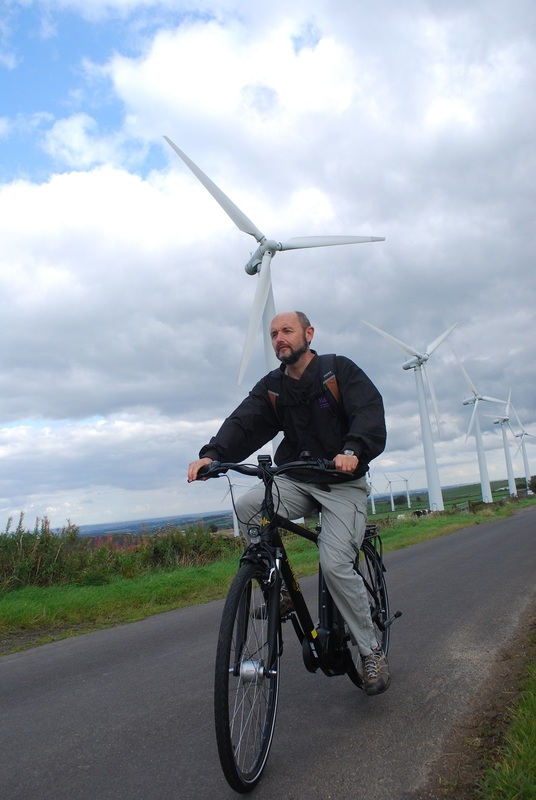 However, the Impulse is still used on current bikes as a very effective, powerful system that can be made available at a very competitive price (often beating Bosch and Shimano powered e-bikes on price). 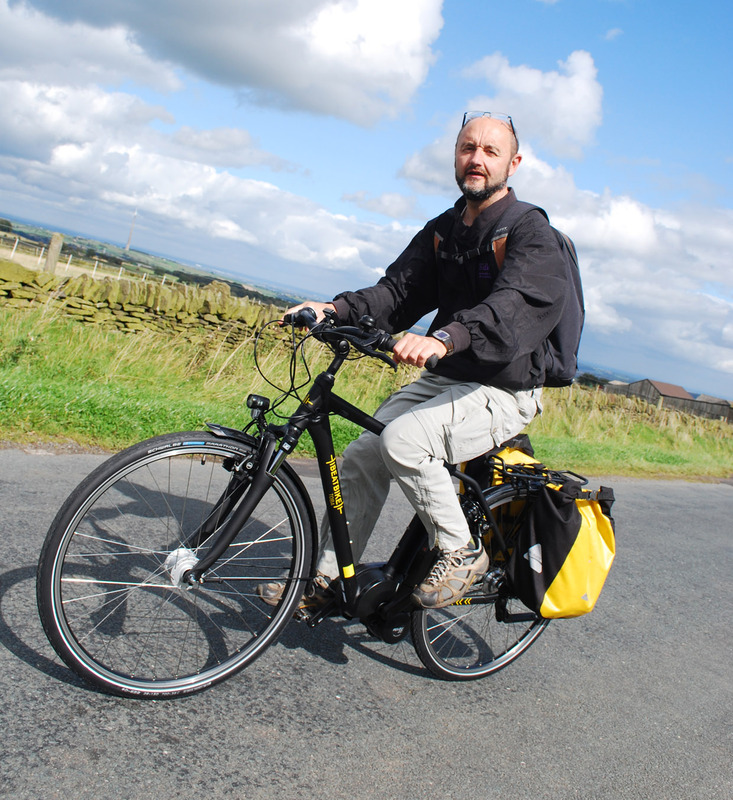 The Impulse motor system is fitted to a very well-equipped commuter bike that would also make a great touring bike. It may not have quite the power or sophistication of the latest crank drive motors but still delivers plenty of hill climbing power and it does it efficiently. Perhaps best of all is the stonkingly big 612 Wh lithium ion battery. Not only good news for the very decent range you will get out of it but also bigger batteries need charging less, so extending battery life and reducing battery replacement costs. Hub gears are great on electric bikes; they are theoretically more inefficient than derailleur gears but the extra motor power available (especially on a bike with such a big battery as the Beat Bike) rather cancels out the effect of such relatively small inefficiencies and still leaves you with a pretty reasonable range. Beat Bikes have opted for the solid and reliable Nexus 7 which has been around a while and proved reliable over a wide range of bikes down the years. Indexing is easy – just adjust the barrel at the cable exit of the rotary hand changer whilst in 4th gear to line up two yellow makes on the hub itself. Stopping power is no problem with the Magura HS11 hydraulic rim brakes; these are not the most powerful in the Magura range but higher spec and much pricier ones are more for off road / performance bikes – the HS11s give loads of stopping power for the average rider, even a heavy rider on a relatively heavy, fully loaded electric bike. The only real downside against hydraulic disc brakes is that you will eventually have to replace worn wheel rims and respoking of the hub gears and dynamo will be required at extra cost. They feature 3-finger brake levers and use a material called Carbotecture which integrates carbon fibres into thermoplastics. Although they lack features found on some more expensive brakes like reach adjust, they are good and reliable choice. The rest of the equipment follows the same brief of practicality and reliability. The AXA LED lighting is powerful and always on and should remain that way for may years, thanks to the front hub dynamo. The Schwalbe Marathon Greenguard reflex tyres incorporate puncture protection and the Marathon range is known for its long-lasting qualities. Mudguards, full chainguard, sturdy kickstand and even a pump and bell complete the package. Like other electric bikes featuring the Impulse system operation is simplicity itself; the bike actually powers up as soon as you put the battery as is choosing one of the three power levels using the control buttons by the left handlebar (handily its illuminated at night). Power is then nicely graduated: Eco is fine for getting up to speed on slight gradients and into slight headwinds, Sport will whizz you up moderate hills whilst the top Power level tackles the steepest hills we could find in the Pennine foothills whilst maintaining a speed of around 12-14 mph quite easily. Only on the local 1 in 3 tarmac bike path (yes there is such a thing!) did the speed drop off to around 8 or 9 mph in bottom gear and max power. It’s really only under such extreme circumstances – or for example regularly hauling very heavy loads up very steep hills – that you might want to think about opting for something slightly punchier with more torque at extreme performance levels (think the likes of Bosch’s Performance line CX – generally found on e-MTBs but also on some hybrids such as the Cube Kathmandu Hybrid Pro 500). Power consumption over the hilly Pennine test course was around 13.5Wh per mile, which is perhaps a little more than you might expect from the most efficient machines, but still very impressive and equates to a battery range of over 45 miles on what was pretty testing terrain. Clearly range would be much more than this over easier terrain or with a lighter rider than the 90kg test pilot. 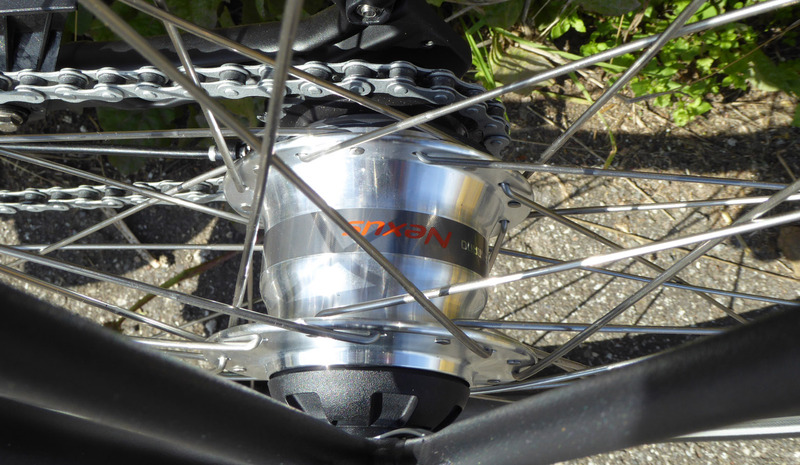 The Nexus 7 hub gears are a solid choice, and give a gear range of 244% with 1st gear being low enough to tackle the very steepest of hills in my Pennine foothills riding territory and 7th gear allowing downhill pedalling to around 25mph (if you don’t think that sounds fast try it!). It’s a comfortable and relaxed riding position thanks to the adjustable handlebar stem and generously padded seat. 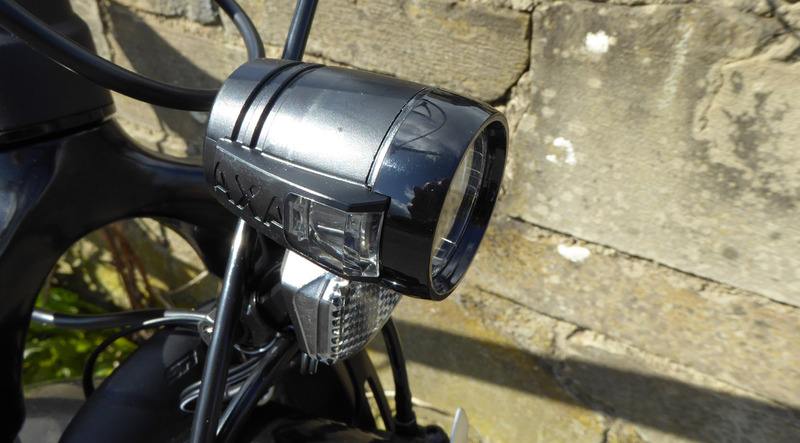 My only real gripe was the dynamo powered front light – why not power it from the battery, save weight and have light all the time (because its dynamo powered the light goes off when you are stationary)? Perhaps the main argument for such a dynamo is ultra-reliability.